Presale tickets for Salem vs. Ursuline District Final at Boardman are on sale in the athletic dept. today until 3:30pm. They will also be available at the District Final Game hosted by Salem tonight from 5:30-7:30pm with Mrs. Shadle at the pass gate. Game Time Saturday is 4pm and doors open at Boardman at 2:30pm. Due to a power outage at Boardman High School the boys basketball district semi-final has been postponed until tomorrow 3/9/17. The game will be played at 6pm as part of a double header. Girard and Ursuline game will be after our game. 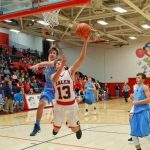 Friday, March 3, 2017 7:00 PM Salem High School AWAY 64 Struthers High School HOME 52 Game Recap The sixth seeded Salem Quakers upset the third seeded Struthers Wildcats 64-52 to capture a sectional title Friday night at Struthers Fieldhouse. 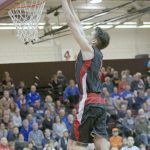 The Quakers (12-12) were led by Chase Ackerman’s game high 20 points and 7 rebounds. Friday, February 17, 2017 7:30 PM Minerva High School AWAY 64 Salem High School HOME 52 Game Recap The Salem Quakers were defeated by the Minerva Lions on Senior Night 64-52 Friday night. Mitch Davidson led all scorers with 26 points for the Quakers (9-12, 4-10). Connor Wright led Minerva (13-8, 8-6) with 16 points.